This one-day inclusive education and training session for city and county officials; managers and staff of municipal, private, and governmental organizations; and private industry will provide essential knowledge needed to plan for, procure and manage design-build for water and wastewater infrastructure projects. Attendees participate in experiential exercises to apply lessons learned to real life projects. Our Mission …To advance the best practices in design-build delivery methods through thought leadership and education, supported by research. WDBC’s research with its stakeholders forms the basis for its ongoing education and training sessions. 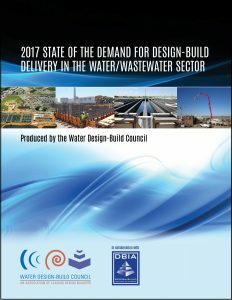 Download your copy of the 2017 State of the Demand for Design-Build Delivery in the Water/Wastewater Sector Today!